the latest style trends have interpreted it in thousands of shades and combinations. From Design to Fashion, from Art to Architecture, the charm of the color gold has always had something magical. Even so much that today the most updated interior designers are rediscovering the virtues of it as the color of well-being, due to its property of stimulating mental and physical energy, according to the principles of Feng Shui. There is nothing more suitable than a gilded detail to make a unique piece of furniture. A sophisticated detail, a glamorous accessory or a precious wallpaper create a unique atmosphere in any room of the house. The colour gold is perfect for every style, from classic to contemporary. By interpreting this new "Golden Age", Arredoclassic has been able to use the color gold in an original way in all its Collections. Gold is definitely the color code of the new Collection Leonardo, presented in April at the Furniture Fair in Milan. Frames, friezes and gilded cornices in gold leaf enrich the linear purity of the furniture, highlighting the profiles or even give them "movement" with embellishments, though always conserving a harmonious setting in the composition. The new Collection Leonardo is now available for immediate delivery. 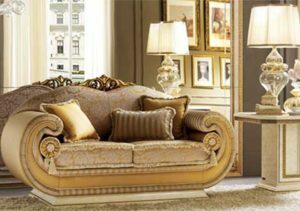 Decorating furniture with gold accents is a choice that indicates taste and personality. You can choose many ways to give light to the house with the precious reflections of gold; small or large backgrounds accents in yellow, amber or red gold, either shiny or matt. Do you need some ideas? In this blog you will find plenty to choose!